جامعة لندن، هي جامعة حكومية مقرها لندن، إنگلترة، المملكة المتحدة، تتبعها أكثر من 31 مؤسسة تعليمية: 19 معهد جامعي مستقل، 12 معهد بحثي. وبذلك، فتعتبر جامعة لندن أكبر جامعة في المملكة المتحدة من حيث عدد الطلاب، حيث ينتمي إليها 135.090 طالب، وأكثر من 45.000 طالب في النظام الخارجي بجامعة لندن. في البداية تأسست الجامعة حسب الميثاق الملكي عام 1836، ثم أصبحت اتحاد جامعة لندن (حاليا جامعة كولديج لندن) وكينگز كولدج (حاليا كينگز كولدج لندن). For most practical purposes, ranging from admission of students to negotiating funding from the government, the 19 constituent colleges are treated as individual universities. Legally speaking they are known as Recognised Bodies, with the authority to examine students and have the university award them degrees. Some colleges have recently obtained the power to award their own degrees and the University has amended its statutes to allow them to do so and yet remain in the university federation. 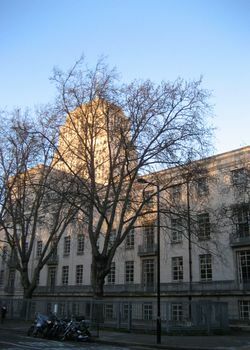 For instance, beginning in the 2007/08 academic year, King's College London, the London School of Economics, the Institute of Education, and the University College London began awarding their own degree certificates while retaining their constituent-college status within the University of London. 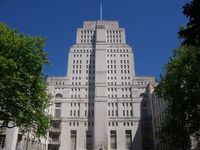 The twelve institutes, or Listed Bodies, within the University of London offer courses leading to degrees that are both examined and awarded by the University of London. Additionally, twelve universities in إنگلترة, several in كندا and many in other Commonwealth countries (notably in East Africa) began life as associate colleges of the university offering such degrees. By the 1970s almost all of these colleges had achieved independence from the University of London. An increasing number of overseas academic institutes offer courses to support students registered for the University of London External System's diplomas and degrees and a new Institutions Policy Framework is currently being developed to accommodate these institutions. 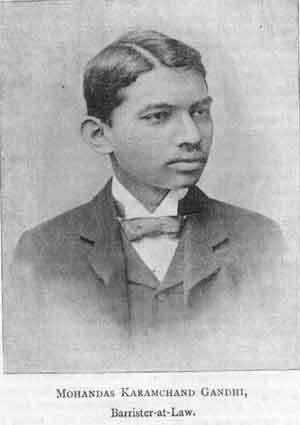 Up to now, no accredidation from London for these schools has existed other than the final examinations administered by the University of London which all pupils take. مجلس الشيوخ، المقر الرئيسي لاتحاد جامعة لندن. جامعة لندن كما رسمها توماس هوسمر شفرد ونشرها في 1827/28. هذا المبنى حالياً هو جزء من كلية جامعة لندن، وتعتبر اليوم واحدة من الجامعات التأسيسية والمعاهد التابعة لجامعة لندن. رسم توضيحي لحدائق بولينگتون 6، مقر ادارة جامعة لندن من 1870 حتى 1899. ]</ref> The arms depict a cross of St George upon which there is a tudor rose surrounded by detailing and surmounted by a crown. Above all of this there is a blue field with an open book upon it. 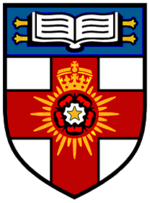 University College Southampton, awarded a Royal Charter in 1952 as the University of Southampton. 1956 - University College of Rhodesia and Nyasaland (now the University of Zimbabwe). 1961 - Royal College Nairobi (now the University of Nairobi). ^ Combined total of "Table 0a - All students by institution, mode of study, level of study, gender and domicile 2005/06". Higher Education Statistics Agency online statistics. Retrieved 2007-07-15. The individual totals are بيربيك، جامعة لندن 19020، المدرسة المركزية للخطابة والدراما 950, Courtauld Institute of Art 395, Goldsmiths, University of London 7615, إمپريال كولدج لندن 12665, معهد أبحاث السرطان 235, معهد التعليم 7215, King's College London 21755, مدرسة أعمال بلندن 1455, مدرسة اقتصاد لندن 8810, London School of Hygiene and Tropical Medicine 975, Queen Mary, University of London 11625, الأكاديمية الملكية للموسيقى 730, Royal Holloway, University of London 7620, Royal Veterinary College 1610, مدرسة الدراسات الشرقية والأفريقية 4525, مدرسة الصيدلة، جامعة لندن 1355, St George's, University of London 3785, كلية جامعة لندن 21620, Central institutes & activities 430. Heythrop College is privately funded and does not appear in HESA statistics. It gives its total number of students as 700. "Prospective Students". Heythrop College website. Retrieved 2007-07-15. Imperial College London has left the University since the year 2005-2006. ^ "About us". University of London External System website. Retrieved 2007-07-15. ^ "University of London News: Imperial College Leaves University of London". Retrieved 2007-12-04.